With the increase in population, residential spaces are getting costlier day by day. This often results in most of us opting for smaller living spaces than what we would have hoped for. But even if you have a small living space, you can do your best to ensure that it is used to the fullest and nothing clutters your abode. We're sure, feeling claustrophobic will be the last thing you would want! You'll be glad to know that there are so many ways to save up space and prevent that claustrophobic feeling. It is a misconception that small homes will appear congested or nothing can be done to save up space, as getting the right sort of interiors will not only help you get more usable space but also negate the visual feel, which smaller spaces often bring with them. Custom-made furniture will be made according to the space available to you. It will, therefore, ensure that not an inch of space is wasted and your home looks bigger and better. Since custom-made furniture is in accordance with your requirement, space is used judiciously. At times, the furniture available in the stores might be bigger than you require and the next available option is smaller than what you can accommodate and what you need. At times, custom-made furniture is also cheaper. For instance, you require a small table for your living room. The ones available at the store will be according to a standard size and will not be according to the small living space you have. In this case, you don't have any option but to buy the big table, which is a waste of money and your home-space. Custom-made furniture is what helps you save on both - cost and space. For more details on saving money while buying furniture - click here. Functional furniture is something that can be used as more than one piece of furniture. For example, you might have come across such sofas which can become a bed, or a study table that can also serve as a document cabinet, or a dining table that can accommodate extra people when needed, or one which just folds flat on a wall when not in use, etc. Such furniture is termed as 'Functional' and is a great option when it comes to limited space houses. With one unit of furniture serving multiple purposes, it reduces the need to buy more furniture and ultimately, saves up space without compromising on the utilities you need. On the other hand, modular furniture is something that makes the most out of the space that is available. It also has concealed storage space and has an elegant appearance. A typical example of modular furniture is a bed which has huge storage space beneath it. This would reduce the need to buy an extra wardrobe for bed sheets, pillows, etc. Similarly, the most common example of a modular furniture set saving up space and adding to the elegance of a home is a Modular kitchen, where there are trollies, shelves and cabinets, which serve all the utility needs + waste no space at all. Ever noticed why a library opts for vertically upward bookshelves? Why aren't the books placed in shelves that are horizontal in orientation? The answer is, pretty simple - Vertical storage saves up space! Also, it adds to the 'sense' of more space - When the storage space is vertical, an optical illusion of higher ceilings is created and hence, the space perception is altered. This method is highly scientific and simple, just opt for vertical storage space against horizontal and feel the difference! Horizontal storage gives a congested look to the house and your space may appear to be lesser than it already is. With houses that already have a small space, opting for horizontal storage can be a mistake as it would further reduce the space perception of your house as well actually reducing the usable space. Hence, ensure that you have more of vertical storage when compared to horizontal ones! 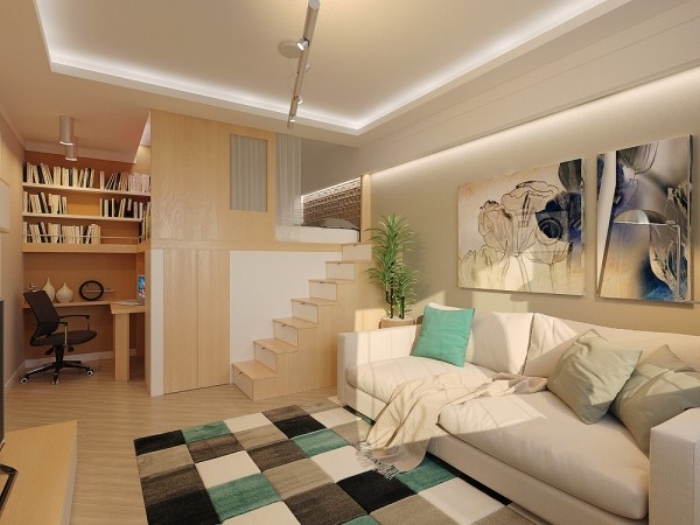 Again, with vertical storage, the floor-space is saved and other furniture components can be placed there. There are a lot of options available when it comes to choosing the interior design style for your home or even office for that matter. However, for smaller spaces, it is best to choose the minimalistic style. Working on the principle of 'Less is more', the minimalistic style uses the bare minimum, yet functional decor and furniture elements so that all the needs are met along with saving space. For Example: A minimalist bedroom would have only a bed along with small side tables and a TV unit (optional) fixed on the wall. Extra stuff that isn't needed such as couches, or study tables, are eliminated or accommodated within the essential furniture by way of functional or modular units. For instance, the edge of the bed could pull out to be a makeshift couch, or the wall mounted TV unit could have a foldable base which opens up as a study table! You might find this a bit theoretical or superficial even, but trust us, colours play a huge role in making a room appear bigger or smaller! Don't opt for dark colours as they give a cluttered appearance to the room. Go for bright and lighter colours, such as yellow, orange, sky blue, white, lavender, light green, or pastels to be safe. These will not only give an illusion of extra space but will be the perfect complement in case your furniture is dark in colour. Also, having mirrors at the right places and of the right length, adds to the sense of space. Many individuals with smaller homes opt for mirrors strategically placed behind the dinning area or on a wall in a living room, to get that exaggerated sense of space. Another important factor to be kept in mind is lighting. By using the correct lighting, your home will appear to be bigger than it actually is. Now, the above aren't space-saving per se, but it complements the other space saving efforts in your home interiors, by giving an heightened illusion of space. Bright colours, correct reflections and lighting are keys to this. 6. Most importantly - Choose Your Interior Designer Wisely! All the above-mentioned things will help you to utilize the limited space you have, in the best possible manner. However, it would be very difficult to achieve the desired results if your interior designer isn’t able to make the most of each square inch carefully. If the designer isn’t able to design within the limited space you have, in the best possible manner; there are chances that your home will appear to be congested with bulky furniture and unnecessary storage spaces. Thus, the most important step to ensure you get the best possible home/office makeover in the available space is to select the designer wisely. Each designer is an expert but it isn’t necessary that every designer understands what you need in a perfect way. Thus, make sure the designer you choose, is able to understand your requirements perfectly. Only choose your designer after you have gone through their portfolio and have had a satisfactory consultation with them. If you feel a certain designer is not able to understand your requirements, it is better to not hire them for your project. Hiring the wrong designer can lead to waste of time and money. If you need help in finding highly experienced designers who can help you make the most of your home/office space, try Hipcouch! Newer PostHere’s How Wrong Lighting is Ruining Your Interiors and How to Do it Right! Older PostWhat Factors Influence the Cost of Your Furniture the Most & How Can You SAVE on It?